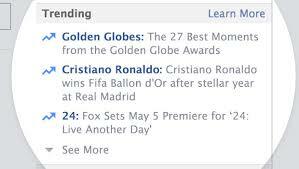 Facebook has kept an end to its "Trending" feature to make way for "future news experiences" which may come up with breaking news notifications. said "We will remove Trending from Facebook next week and we will also remove products and third-party partner integrations that rely on the Trends API,"
We are aware that Facebook has launched Trending feature in 2014 aiming to help people discover news topics that were popular across the community. Headlines were initially selected by human editors and a former contractor on the project claimed that Facebook used this feature to promote liberal causes and suppress conservative issues, NBC News reported. "From research we found that over time people found the product to be less and less useful,We're exploring new ways to help people stay informed about timely, breaking news that matters to them, while making sure the news they see on Facebook is from trustworthy and quality sources" Hardiman said. "We're also testing breaking news notifications," Hardiman said. Facebook is also testing a dedicated section called "Today In" that connects people to the latest breaking and important news from local publishers in their city, as well as updates from local officials and organisations. "We will soon have a dedicated section on Facebook Watch in the US where people can view live coverage, daily news briefings and weekly deep dives that are exclusive to Watch," Hardiman added. "We are committed to ensuring the news that people see on Facebook is high quality, and we're investing in ways to better draw attention to breaking news when it matters most," she said.